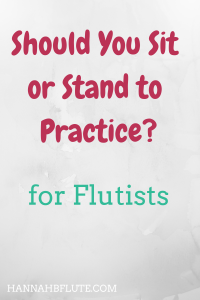 Let’s debunk the two common playing positions for flutists! Because spoiler: they’re both totally fine! Which is Better: Sit or Stand? As flute players, we often have to jump between sitting and standing while playing. In an ensemble, you probably have to sit. On the other hand, most flute soloists stand while they play. Neither position is better or worse in all cases. Let’s be honest. You probably want to sit during a long orchestra concert. And if you get to perform a concerto, then of course you want to stand for the spotlight! So let’s look at the pros and cons for sitting and standing while practicing. One of the biggest pros to sitting is that your feet won’t hurt after a long practice session. I know that my feet tend to hurt after I stand for awhile. If I’m practicing for some time, I need to take breaks every so often so that my feet get a break. Another pro is that it prepares you for performing when seated. In orchestra, band, and even flute choir, you’ll probably have to sit. If you play in a wind quintet, you’ll probably sit. So the more you practice playing when sitting, the easier it will be. The third benefit to sitting while practicing is that it forces you to develop good posture. I know I tend to slump over when I sit. If I practice sitting, then I have to force myself to sit up so that I can take deeper breaths. I feel very restricted when I sit, especially if I practice by myself. When I practice, I like to move. Sitting down takes that ability to move away from me. If you sit all of the time, you won’t know what it feels like to stand and perform. While sitting to practice can help you for ensembles, it won’t prepare you for solo performances. As a soloist, you usually stand. So make sure that you practice your solo music on your feet. Finally, sitting to practice can make you feel lazy. If I sit, it can feel like I don’t have to do anything. Practicing almost seems too easy. Of course, the biggest benefit to standing in the practice room is that you can breathe better. As flutists, our air is super important. When you stand, you can take advantage of your entire lung capacity. That’s not so easy in a chair. Next, there’s posture. Of course, posture is important no matter whether you sit or stand to play. But it’s much easier to maintain good posture when you stand. Finally, you can move and stretch. Again, I like to move a little bit when I practice. Obviously, I make sure my flute stays in place, but I can’t play like a statue. Standing allows me to move around a bit. I don’t know about you, but my feet hurt after a couple of hours of standing. If I practice for long periods, my feet are the reason I have to take a break. That’s not the case if you sit to practice. The second con is that it can make ensemble rehearsals more difficult. Getting used to sitting while playing isn’t easy. Add to that a group that doesn’t have much wiggle room for the flutes, and it can be really uncomfortable. Also, not every practice room has a music stand. And some stands might not extend high enough for you to stand up. If you’re used to practicing while standing, it can be hard to practice without a proper music stand. So you know the pros and cons, but you still can’t decide if you should sit or stand to practice. Are there other things to consider? If you only ever play in ensembles that sit, then you should sit to practice. On the other hand, primarily solo players should consider standing. And if you do both? Sometimes, your practice position will depend on your practice space. If you don’t have a chair in your practice space, then you’ll have to stand. If you have to use a piano as your music stand, sitting it is! Are you lucky enough to have the perfect practice space? Then you get to choose whether you sit or stand. Or you can alternate between the two. Practice is a very personal thing and so is the “sit or stand” debate. No matter which position you choose, make sure you’re comfortable and that you don’t hurt yourself.